Welcome to your home by the sea, a hotel and resort set on absolute beachfront, North Pattaya. Complete with a spa and meeting venues that enjoy sea views, all rooms & suites have private balconies, perfect for romantic getaways & working holidays alike. 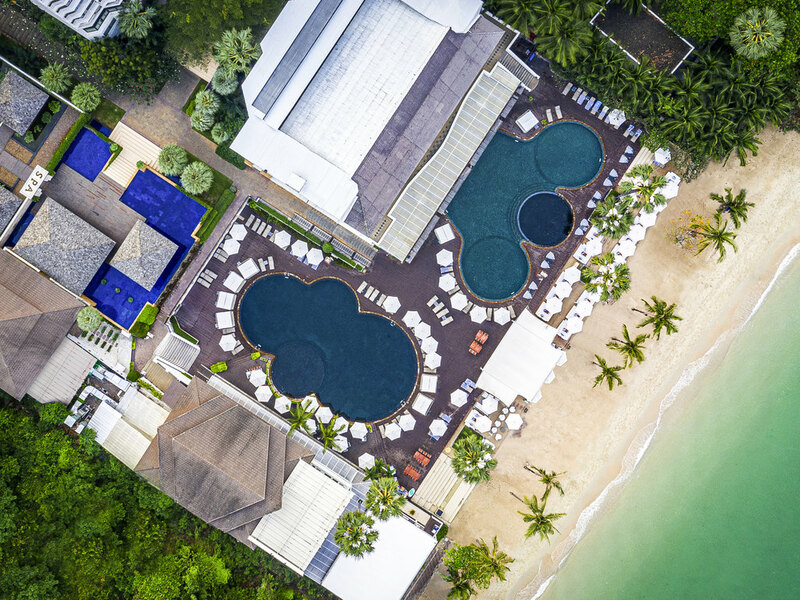 Set amid a lush tropical garden with absolute beach frontage on a private section on the Wong Amat beach, this resort hotel is perfect for a romantic getaway or a working holiday. With 353 stylish rooms each equipped with a private balcony. What was once a quaint fishing village in the 1960s is now a bustling and vibrant resort town which attracts over 5 million visitors each year. Easily one of Thailand's biggest tourism draw cards, Pattaya makes for a fascinating and fun filled vacation. All rooms and suites offer fresh, contemporary design blended with local Thai décor. Open and spacious, most also feature private balconies and idyllic sea views while some provide direct access to the pool or access to the Executive Club Lounge. At the private Beach Club guests can spend their down time enjoying chill out music either at the pool or at the beach, fancy cool cocktails, the widest selection of wines and fine cuisine or simply enjoy a serene setting of fresh sea breeze. With an optimal location at the lobby, the Lobby Lounge offers an unlimited selection of beverages and fine teas. It is the place to hang out, chill out and get connected through our connectivity lounge. Nestled in one corner of the Beach Club, the bar offers cocktail drinks, salads, sandwiches, grilled items and ice cream. During the day, easy to prepare food items and drinks are available. Right on the beach front, the bar boasts a large selection of cocktails and spirits. It is the ideal place to quench your thirst while enjoying the sunny tropics. At dusk, a unique champagne selection is presented to complete your day. I liked the rooms and beach bar alot. I found the breakfast to be too crowded and messy. Maybe you should do breakfast in 2 places next time round. Also not enough pool chairs. Staff is very attentive to our needs especially during checking in and out ,also staff at the executive lounge always put up a wonderful smiles no matter how busy they are, overall a wonderful stay ..
As always great experience and would like to thank Nong Lipton at the reception and also Peter at the beachside pool. There was also a wonderful Philippine boy at the beach side. Thankyou so much . hotel have a lot of activities for guest to join. it's very nice. Very nice hotel staff are friendly. I takes too long time at reception, they need my ROP e-voucher only by e-mail format. But I have only iPhone Wallet format. Even though it contains the exactly same information. I have to capture the screen and send to their e-mail address. There are many other convenience ways to get this information. The room is good but it doesn’t meet my requirement that need the high floor. Actually I only need you to tell us at the reception. The room is OK except the dummy HDMI port. The hotel and rooms and facilities as fittness and playground for children are fine. The south side of the hotel is, however, very dominated by the scyscrapers next to the hotel. We got a room right infront of the scrapscrapers even though we ordered a room with ocean veiw. We were then moved to the north side of the hotel which was much better. The breakfast resturant is not good, not at all meeting 5 star as promised. It is too small and therefore very crowded. Difficult to get hot coffe, difficult to get attention from the staff. Not enough staff. Slow refilling. Only one person making omelets for all the guests in the resturant, so you had to stand in long line and wait. There was an upstairs resturant with plenty of space which we were not allowed to use. Apperently only for special guest or rooms which I find it hard to understand in a hotel rated as 5 star. Good food , nice view , private beach and clean room. The hotel is on the beach next to north pattaya. It was not crowded, good for relaxation. This is the fourth time to stay this hotel. Your employees have service mind,polite, and give the good experiences with us. Moreover,I am accor plus member,so I got discounts many things such as food, spa,birthday cake. We are happy with Pullman G.
We often stay here when we are in Pattaya as staff is very friendly and helpful. We have requested hotel to arrange birthday cake to my son. Hotel has a great arrangement on birthday cake and room decoration. Thank for this special request. Staff can remember our regular request when we stay here. Room still has a good maintenance as usual. This time we change our usual room type from executive to deluxe room as we spend our family time at Cartoon Network. It is still comfortable just only difference is lounge access. We will be back for sure as we stay here around 3-4 times a year for more than 10 years. This hotel lives up to the Pullman standard . Lovely friendly staff beach bar and 2 lovely pools. Excellent food and the seafood bbq on Friday and Saturday nights are worth enjoying. We had a Seaview room and enjoyed the executive lounge. In room’s amenities are insufficient.